Cheri and I have been working extremely hard in our preparations for our upcoming Summer Shows! We are very honoured to have been invited to take part in The West Fine Art Show. Cloverdale Rodeo May 20th – 23rd. 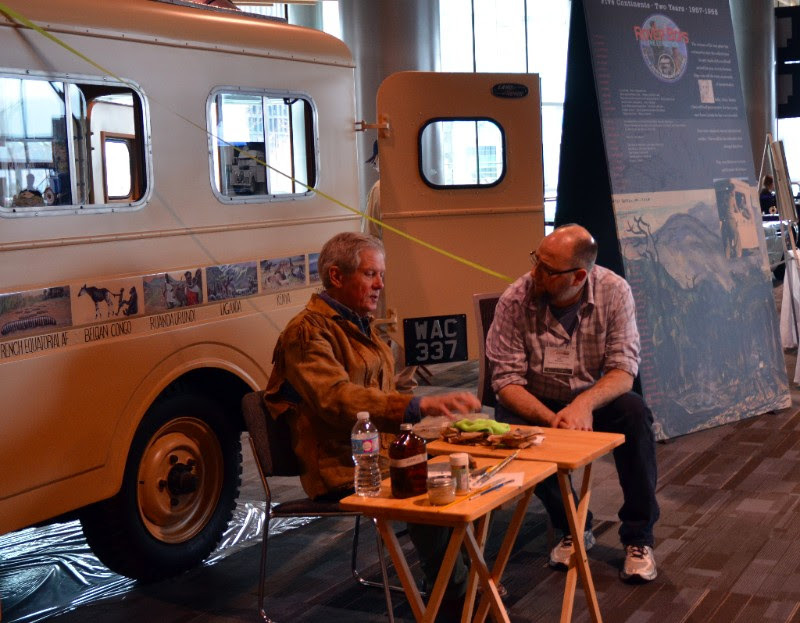 This past March, I was invited to spend the day assisting Robert Bateman in touching up the paintings on the Land Rover he and Bristol Foster drove around the world in 1958. I taught myself how to paint by studying his work, and have always deeply admired both his artwork and his voice for the conservation of our natural world. People warn you to never meet your idol as they’ll never live up to your perception of that person, but Bateman truly is an amazing individual. 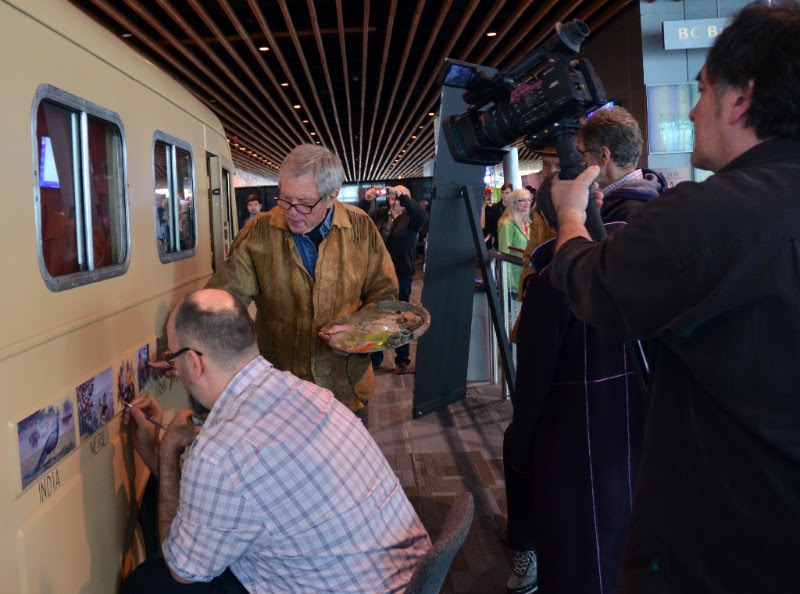 He is a wealth of information and an incredibly kind and generous artist. My second coin in the Royal Canadian Mint Historic Tall Ship set has been released this month. This coin, which is part of a 4 coin series featuring my artwork, captures the Marco Polo. 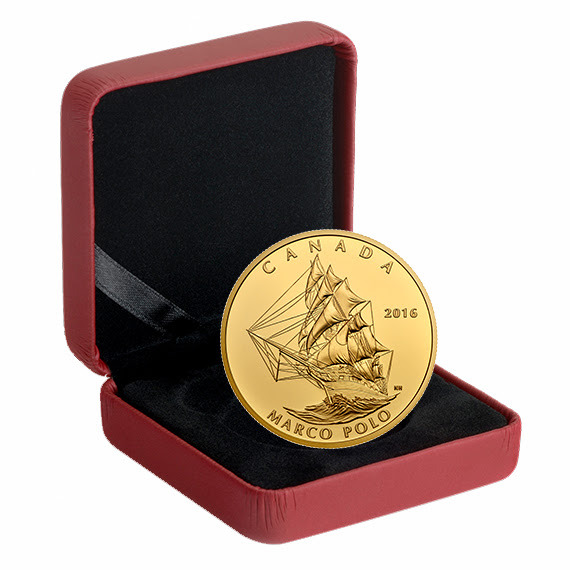 This coin was a real challenge to create as there is very little visual information pertaining to the Marco Polo. Cheri and I contacted Maritime Museums around the world researching this one. In it’s day she was one of the fastest ships in the world and in order to honour that, I created the Marco Polo with a full complement of sails, racing through the ocean from a perspective that has us looking up and admiring her. ‘Vestige’, 24″x34″ acrylic on hardboard. This painting is one that I just finished. It captures a scene that I created using inspiration from various locations and subjects. I wanted to capture the feel of a dry harsh land with evidence left behind of the people that once made a life there. 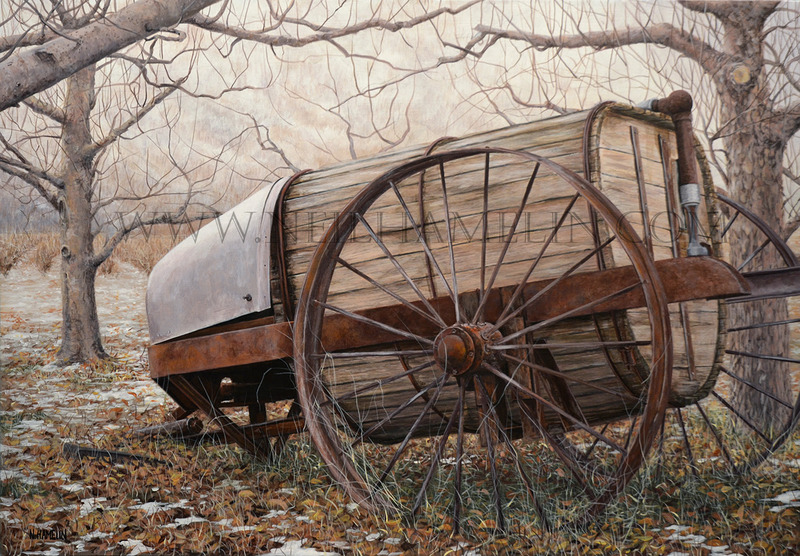 ‘Orchard Water Wagon’,16″x23″ Acrylic on board. I found this old wagon on an orchard in Keremeos and was really drawn to the weathered wood and rust. The fall colours and lighting on that day really enhanced the feel to this little scene. ‘Out Of Season’, 22″x30.5″ Acrylic on board. Cheri and I stumbled upon this scene on a drive through the Okanagan last November. 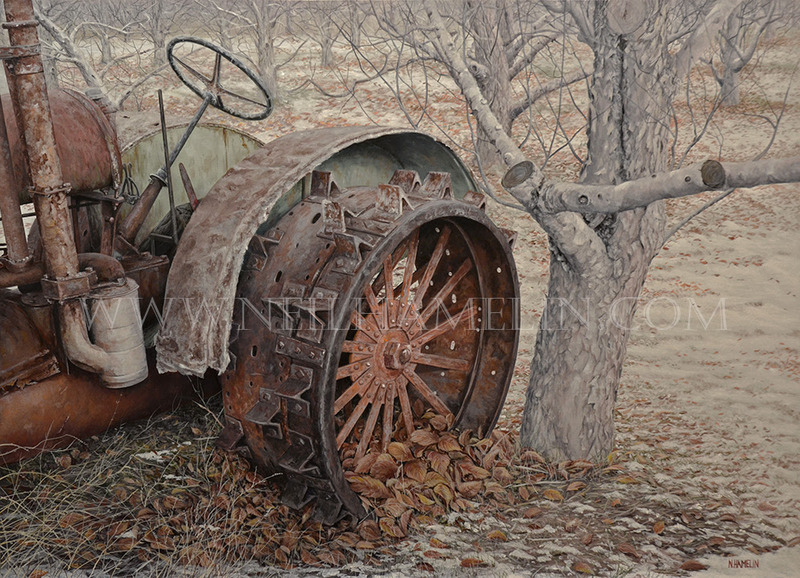 I really like the subtle green and orange found on the tractor and the overall feeling of late Fall in this Orchard. 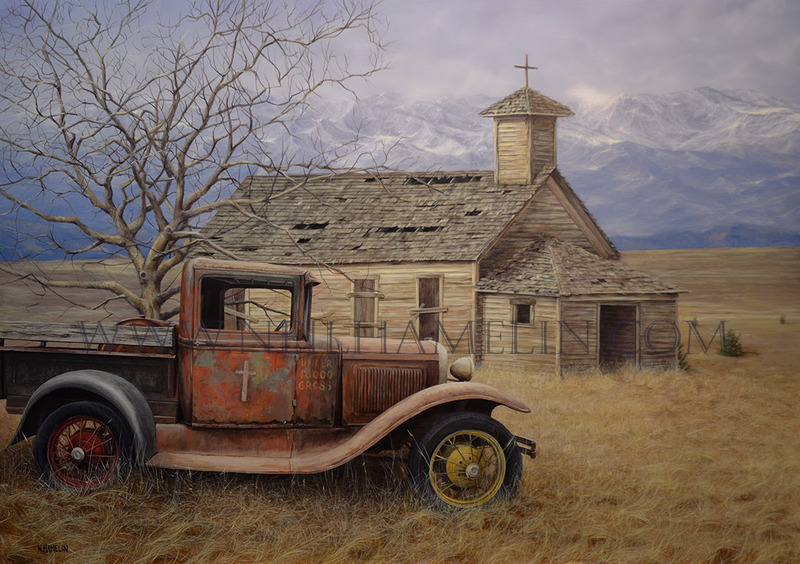 ‘Corralled Coupe’, 20″x34″ Acrylic on board. This painting is a compilation of different scenes I have been inspired by. This is a 1937 Chevy Coupe in bone stock form. 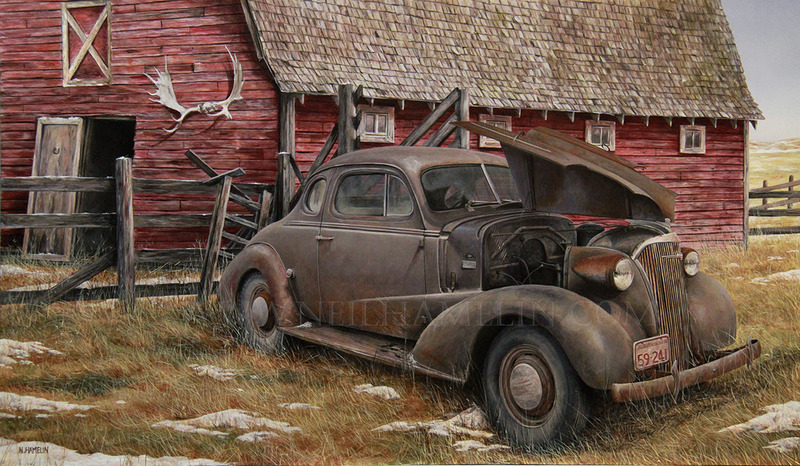 These cars are a favourite with Hot Rodders, but I have painted this one to capture an honest old car on a homestead. From the aggressive mud and snow tires on the rear for those country roads, the dirt sprayed up along the side, and the paint job that has been slowly eroded over its life from exposure to the elements, this car looks right in place on the farm.